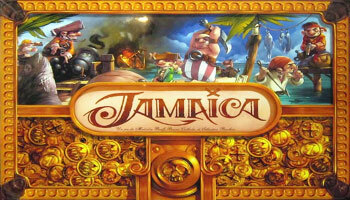 Official Site: Jamaica -- Homepage on the Game Works website. Jamaica is a pirate-themed racing game for 2-6 players. They all race around the island of Jamaica while shooiting cannons at each other and stealing treasures to get the most gold. Each player has a plastic ship and a hold with 5 cargo slots, as well as a deck of 12 cards. The game is played in rounds. At the start of each round, one player is designated as captain with the next clockwise player being captain in the following round. The captain rolls 2 dice. Then he or she decides which one to put in the day slot and which in the night slot. The players have also a hand of 3 cards and all players simultaneously choose one card to play. The cards have 2 symbols, one for the day and one for the night. These can get you cannons, gold, food or move (forward or backwards) around Jamaica. After every player has selected a card and placed it face-down on the table, all cards are revealed and resolved clockwise one by one, starting with the captain. The player must decide which of their current three cards would best serve them on a particular turn, given the values of the day and night dice. When moving, the player must go the exact number of spaces. In deep sea, they must discard food tokens equal to the number shown on the space. At a port, they must discard doubloons equal to the number shown. At a pirate's lair with a treasure, they remove the token and draw the top treasure card. When a player cannot pay the food or doubloons, they must pay as much as they can and then move their ship backwards until they get to a space that they can afford. If a player lands with his shop on an occupied spot a battle will take place. A battle is resolved by rolling the 'combat' die. Players may improve their chances by using gunpowder tokens from their holds. The winner of the battle may steal some goods or treasures from the defeated player. The winner is the player who best balances their position in the race with their success at the side goals. 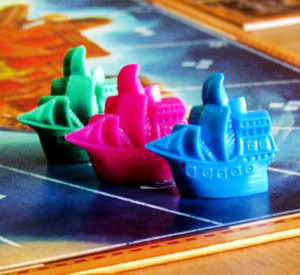 The game ends on the turn when at least one player's ship reaches Port Royale. Then he completes one circuit around the island of Jamaica. All players are awarded an amount of gold in accordance with how far away from the finish line they are. This gold is added to the gold gathered by stealing gold or treasures from other players along the race. You also may receive gold direct by played cards. The player with the most gold on the end wins the game. Jamaica is a simple family game. Do not expect complexity and to win the game depends a bit on luck. That's fine for family play but not for competitive players. 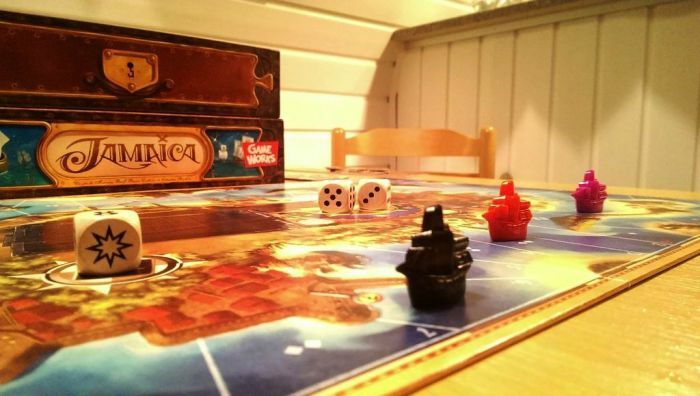 The role of the captain is still interesting as he can choose the best combination of dice for himself. The amount of battles depends on the number of players. The more players, the more frequently battles. So, more players make the game better and add fun. Jamaica is created Malcolm Braff, Bruno Cathala and Sébastien Pauchon. It came out in 2007 and is published Asmodee.